Kjell Theøry: Prologue is an exhibition and Augmented Reality (AR) experience juxtaposing the historical narrative of gay computing pioneer Alan Turing’s forced chemical castration and subsequent gynecomastia (development of breasts) with algorithmic mutations of Guillaume Apollinaire’s 1917 play, Les Mamelles de Tirésias (Tirésias’ Breasts), a genderfluid spectacle for which the author invented the word “surrealism.” In Apollinaire’s play, a woman Theresa, transforms into the male prophet, Tiresias, while her husband gives birth to 40,049 babies. The play was intended as a staged plea for the men of France to replenish the population after the devastation of the first world war. In the last two years of his life, Alan Turing began to visit Scandinavia, seeking tolerance and pursuing desire, following his prosecution for crimes of indecency. He had shifted his focus from computing to biology and was developing a theory of morphogenesis, the autonomous generation of flowers and other natural forms. It appears, from his notes, that he named his theory for a male Norwegian love interest, Kjell. His situation with whom he calls Den Norske Gutte, the “Norwegian boy,” is poorly documented but evidence suggests that it threatened to escalate into further legal troubles. Kjell Theøry: Prologue is a poetic and choreographic system that blurs the boundaries between the binaries of physical and virtual space, past and future, male and female genders, and human and machine. Anatomical Theatres of Mixed Reality (ATOM-r) is a provisional collective exploring forensics, anatomy, and 21st-century embodiment through performance, language and emerging technologies. 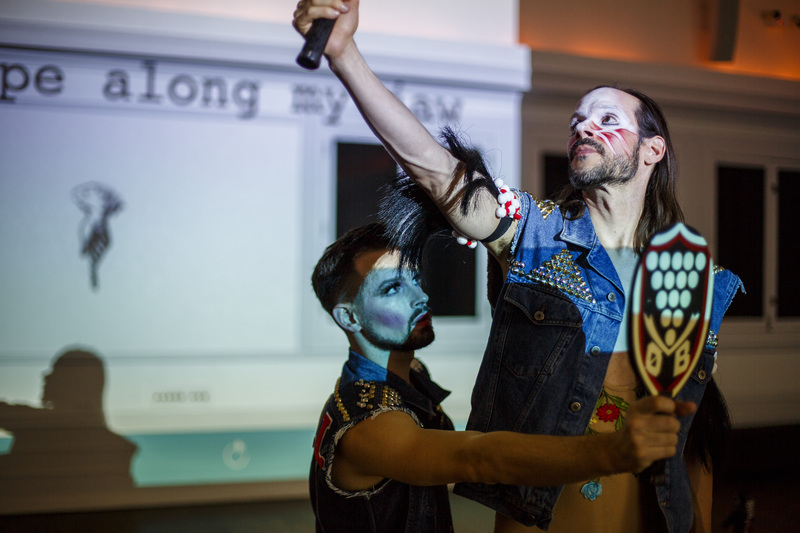 Participants include Mark Jeffery (choreography), Judd Morrissey (text and technology), Justin Deschamps and Christopher Knowlton (collaborators/performers). Collaborators on Kjell Theøry: Prologue include: Grace DuVal (costumes); Elena Ailes, Claire Ashley, Bryan Saner, Laura Prieto-Velasco, Stephen Reynolds, and Oli Watt (objects); Leonardo Kaplan (performance); Mev Luna (research assistant); Joshua Patterson (sound); Josh Hoglund (lighting); Javier Lopez (graphic design); and Julia Pello (video). This exhibit is presented in conjunction with live performances at the Graham Foundation for Advanced Studies in the Arts (See dates and details below) and marks the conclusion of ATOM-r’s Residency at the International Museum of Surgical Science. To learn more about ATOM-r, follow them online at www.atom-r.com, Tumblr or Facebook, and Instagram. The IMSS Artist Residency Program provides artists with extended and in-depth access to artifacts from its collection, working space within the Museum, and support to present exhibitions that introduce additional perspectives to the institutional depiction of medical history. As artistic practice occupies an increasingly pluralistic field, The International Museum of Surgical Science believes that artists are uniquely equipped to extrapolate on Museum collections in innovative ways. Artists-in-Residence present a capstone exhibition at the end of their residency. All Performances Begin at 7:00 PM. *Exhibit extended from February 26, 2017, to April 9, 2017. Associated video screening in Gallery 4H ends Sunday, February 26, 2017.